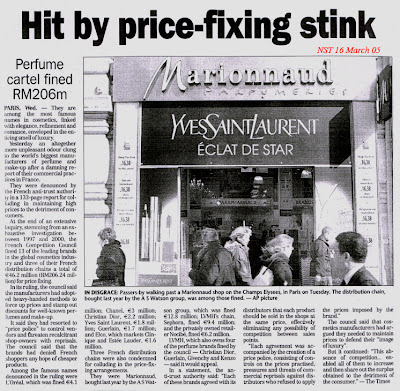 Thirteen leading fragrance companies have been sentenced to a total of more than 40 million in fines by the Court of Appeal of Paris for price fixing leading up to an oligopoly/collusion. The Court upheld a decision by the Competition Authority ruled in 2006 against thirteen major names in luxury and three distribution companies of perfumes and cosmetics, for fixing a retail price of products to standardize prices up , as the Court viewed by AFP. The condemned perfume brands are: Chanel, Beauté Prestige International (Jean Paul Gaultier and Issey Miyake fragrances), Clarins Fragance Group (including Thierry Mugler perfumes), Hermès Parfums, Parfums Christian Dior, Elco (Clinique and Estee Lauder), Guerlain, L'Oreal, LVMH Fragance Brands, Sisheido Europe, and YSL Beauté. The condemned distributors are retail sales giants: Marionnaud, Sephora and Nocibé. The luxury groups in question locked a "street price" of products and the discount rate than they were allowed to practice with their distributors in order to level up prices to the detriment of the consumer, as the Competition Council established in its first decision in 2006. They also accused the suppliers of establishing a "price police", in other words, price controls, pressures and threats of trade retaliation vis-à-vis the recalcitrant distributors. Interestingly, the amount of the total fine now was reduced from 46.2 million euros to 40.20 euros. How will the money from fines be spent? The world will only profit and become more green if the natural world is protected with these fine moneys. How about a portion going to Haiti to rebuild the hill sides and plant trees with protection around them. Some solar heating devices and wind mills so the people will not have to use the young trees for fuel. My mother born there. How about some fountains for the public that the Italians are famous for designing. Let this fine do some good for the world and a former colony. Of course, the more serious case of collusion is that of aromachemical companies against natural materials through the IFRA restrictions, but unfortunately, there seems to be no action in this regard. Is there a typo? Reduced to 40.20 euros or 40.20 million euros? I don't think they're going to do either of those, though your thought is very noble. Alas! that too, you're right in a way. But the peculiar thing is that IFRA is also banning/restricting cheaper aromachemicals right and left (heliotropin anyone?)! So it's not just that. It must be on a higher level of paranormal activity. yeah, that's what I meant. I thought it was sequitur, guess it's not, so thanks, will edit it.